This collection of fun graphics is perfect for your Valentine project needs. This set includes 40 different graphics of 26 uppercase letters, 10 numbers, question mark, exclamation heart & ampersand stamped in Orange Conversation Hearts. Also includes one blank heart. Great collection for web design, making scrapbook pages, cards, labels, tags, invitations, and other printables. 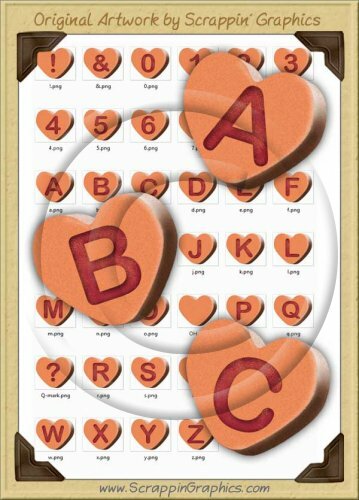 Graphics can be used for commercial use but CANNOT be used to make other conversation heart sets or alphas. These large 300 dpi graphics work well for your printing and crafting needs but can easily be reduced in size for use in web designs. The graphics come in high quality JPG format. Original artwork by Scrappin' Graphics.